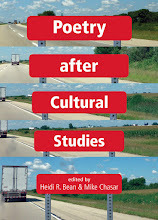 Somewhere en route between Minneapolis and East Lansing, Steve Healey stops to take in the huffs, puffs, gasps, chokes, pants, gulps and luscious lip smacks that comprise The 60 Second Anthology of American Poetry. How much, he wonders, can poetry be counted on to take one's breath away? Has the anthology reached what one might now call its expiration date? And what, exactly, does being swallowed by a sea of saliva feel like? For answers to these questions and more, read on. Exquisitely cranky Pierre Bourdieu (pictured here) argues that poetry's high cultural prestige combined with its tiny audience makes it—even more than the other arts—"destined ... to a continuous struggle for the monopoly of poetic legitimacy." Anthologies from Louis Untermeyer's Modern American Poetry (1919) to Dave Smith and David Bottoms's Morrow Anthology of Younger American Poets (1985) have long been potent weapons on this battleground of literary status, and as they help make careers for some, these "flower collections" (as they were called by the Greeks) are also fiercely denounced for being cliquish and exclusionary. Breathing new life (literally) into this old conversation is an unusual poetry anthology I recently encountered. It’s actually an audio piece called “The 60 Second Anthology of American Poetry,” found on the website of an organization called Language Removal Services (LRS). As I learned in correspondence with LRS representative, Chris Kubick, this piece is “a dense collage of breaths, lip smacks and other bodily sounds which all come from between the words of recordings of American poets reading their works.” In other words, there are no words in this poetry collection, and this absence provokes some provocative questions: Can poetry exist without its words? If so, what then is poetry? It’s often said that poems exploit the gaps in meaning and the silences between words, and there’s been some excitement lately about erasures (poems found in the remains of partially-erased pre-existing texts). But this LRS anthology arguably asks us to travel much farther into the void, suggesting that poetry can be found in nothing at all. In that darkness, might we best read (or hear) this 60 second sound trip as a cynical jab at the pretensions of high-brow poetry and its anthology industry, or as a comical, easy-to-digest bonbon for a post-literary consumer culture? Kubick admits that the LRS project has this kind of critical edge, but he sees his work as primarily celebratory and sincere, an attempt to reorient listeners’ attention “away from the abstractions of language and onto the breaths and bodies of the speakers in all their sexuality, raw power, and musical glory.” LRS has performed its peculiar surgery on many recordings of well-known voices—including many non-literary figures, from Marlene Dietrich to MLK—and Kubick points out that most of them are people he greatly admires. Still, when pressed for the names of poets who were included in (or removed from) this anthology, Kubick is evasive. He mentions having operated on a wide range of poet voices, from Gertrude Stein to John Ashbery, but he says that the choices he made for the anthology itself are “somewhat personal.” So despite LRS’s reverence for poetry, it appears unwilling to engage in the canon wars. Perhaps, like many visitors to Poetry & Popular Culture, LRS thrives on the impossibility of answering the question: what is poetry? Steve Healey's first book of poems Earthling is available from Coffee House Press, and a second is due out soon. When you get a chance, also check out his article "The Rise of Creative Writing and the New Value of Creativity" in the February 2009 issue of The Writer's Chronicle; it's part of a book manuscript which he'll be finishing at Michigan State during the 2009-10 academic year.